Hyperopia or hypermetropia, from the Greek word "hyper-metropia , is a defect of vision caused by an imperfection in the eye (often when the eyeball is too short or the lens cannot become round enough), causing difficulty focusing on near objects, and in extreme cases causing a sufferer to be unable to focus on objects at any distance. As an object moves toward the eye, the eye must increase its optical power to keep the image in focus on the retina. 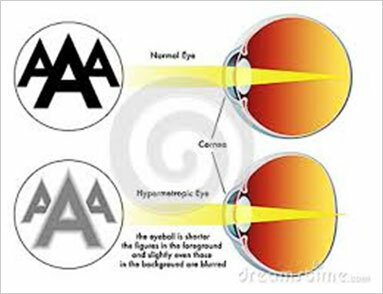 If the power of the cornea and lens is insufficient, as in hyperopia, the image will appear blurred. I Enjoy Coming Here At Vision Yoga, Because It Helped Me Get Rid Of My Glasses For Good. Over the years I was blindly believing that my numbers was due to heredity . However after coming to Vision Yoga I realized that with regular exercises and discipline it is possible to achieve healthy vision. When I joined ‘vision yoga’ my number was ( +5.00 ), after one month of exercises, today it is ( +2.50 ) - exactly half. I train students to join ‘Indian armed forces’ and ‘merchant navy’ as officers. I have sent many of my students to vision yoga and in all cases i have received positive results. This centre is a boon to those who want to join army and merchant navy. Thank You Vision Yoga And Viram Aggarwal Sir. You Have Given Us A Hope. Earlier I Was Disappointed But Now I Am Very Confident. My Daughter Has Increased Her Vision. Now She Can Read Four Lines From 6 M. I Am Very Happy With This Result And Determined To Do Exercise Regularly. again Thanks For Giving Hope. Dinank 17-05-14 Te 31-5-14 Yadon Aathvadyancha Kalavadhi Nishchit Karnyat Aala Hota. Dabya Dolas +1.50 Tar Ujwya Dolas +1.00 Number Hota. Don Athwadyanchaya Niyamit Sarawane Donahi Dolancha Number Poorn Gela. Sarawa Darmyan Dr. Ni 4 Taas Mahitiche Uttam Vyakhyan Dile. Dolyanchi Rachana Wa Vyayamache Shastrie Tyacha Khupach Upyog Jhala. Hasat Khelat Gyanvardhanatmak Mahiti Denyache Tantravakhaganya Joge Aahe, Kontehi Aushadh, Shastra Kriya Na Karata Keval 1 Taas Vyayamane Dolyanchi Kshamta Badvoon Chashma Gela Ha Kharokharch Chamatkar Aahe. Vision Yoga La Khup-khup Dhanyawad, Wa Dr. Che Manpurvak Aabhar. It Is A Great Institution Who Is Working Towards Betterment Of Eye Vision Of Children’s, Adults And Even Those Who Have Given Up On Their Eye Sight. God Bless Dr Viram And Their Family And Entire Staff Of Vision Yoga. keep Up The Good Work. You Truly Make Difference To People’s Life. Excellent Course. Simple Exercises Which Can Be Followed By Children Too. May Is Soon Start These Courses In Every School. Thank You For Helping Me Remove My Spectacles And Improving My Vision And Helping Me Say Bye To My ‘chasmas’. Thanks To Vision Yoga (dr. Viram Agrawal And Team). My Sons Vision Increased Drastically (he Got Rid Of His Spectacles). It Is Not Just Treatment, It Is Treatment With Explanation & More Importantly – Results. I Am Extremely Happy And Satisfied. I Will Definitely Promote Vision Yoga From My Side & Try To Make Dr. Viram Agrawals Dream Come True Of Everyone Knowing About Vision Yoga And Its Benefits. once Again A Very Big Thank You. Diya Was Wearing Glasses And Had Complain About Tears While Watching Tv. Today She Can Read Without Spectacles By After Exercises. Thanks To Vision Yoga For Improving Eye Sight. Exercises Are Very Normal And Do Able At Home. thank You For Making It Simple Which Was Looking Almost Impossible. a Big Thank You. Before Joining The Course As Vision Yoga My Child Has (+9) (-1.5) On Both The Eyes. My Child Of Has Completed One Month Course In (two Weeks) And At The End Of The Course His Power Is Reduced. Now The Power In Both Eyes Is (+5.5) (-1.0). Thank You Vision Yoga Helps As To Improve The Vision Of My Child Such A Short Time. thanking You Very Much. Advait Had Great Fun With All Didies. Thank You For All Help And Support. Love And Wishes For All.